In this article I will concentrate on the traditional Japanese style that the film retains amd the stylistic influence the western genre had on Akira Kurosawa’s Yojimbo. However it should be noted like Stray Dog the Film Noir genre influenced Yojimbo and the film directly alludes to The Glass Key (1942) – particularly the capture and torture scene. A close-analysis of the links between Yojimbo, The Glass Key, and Dashiell Hammett’s novel Red Harvest would require a large study in itself. The introduction to the protagonist contains a homage to the wide-open vistas of director John Ford’s westerns. Kurosawa was reputed to be an avid fan of Ford’s use of open spaces as well as his framing device of filming through windows and door frames in a town or domestic scene. Kurosawa uses the panoramic to highlight how lost the protagonist is in the wilderness, and how isolated he is from domesticity and home. As the protagonist is drinking water we see a domestic scene filmed in the style of Ford. Like Ethan in The Searchers our nameless protagonist can only peer into domesticity, symbolised by us seeing him through a door frame. 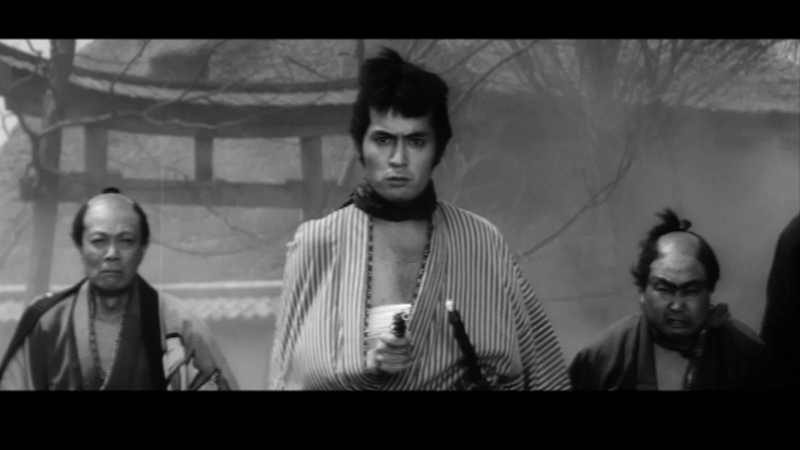 Another aspect of the western that Yojimbo alludes to is the shoot-out or face-off. 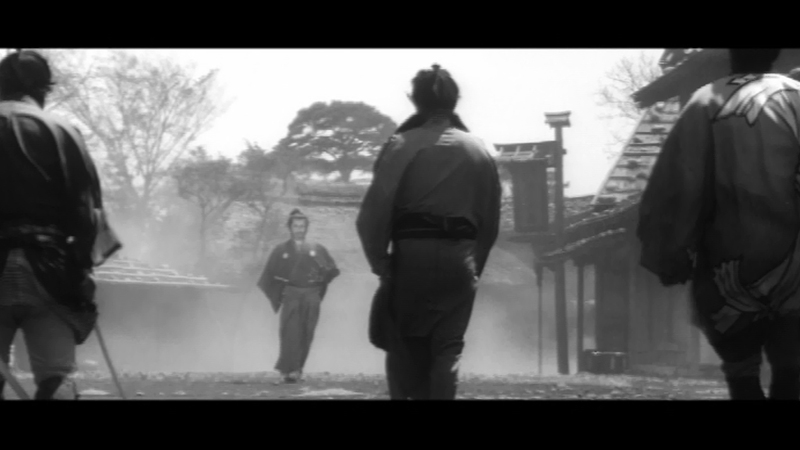 The formal style of the western influences Kurosawa as the shoot-out is a way of communicating the crucible of emotions that come before violent action. The style of the shoot-out communicates both the spatial environment but also the intense emotional drama that is about to unfold. The shoot-out is also a romantic way of capturing combat. Recent historical evidence shows that most fighting in the American west were ambushes or ‘bushwhacks’. To be shot in the back was more common than being shot facing one’s enemy. With the medicine available at the time it is understandable, however in light of these facts it is evident that the romantic vision of the gunfight was used both as a tool in which he creates suspense and spectacle but also to imbue violent, cruel individuals with a sense of honour and respectability. Yojimbo is a film that both refers to the Japanese genre of ‘Jidai-geki’ a historical genre which ‘primarily refers to films set in the latter part of the Tokugawa era, from the early 1600’s to 1867’ and to the similar western genre.1 Jidai-geki films tend to ‘centre on swordsmen of fictional, legendary, or actual historical origin’ much like the western genre centres around a gunfighter and just like the westerns’ centrepiece of the violent ‘shoot-out and saloon fight’ the Jidai-geki has a comparative centrepiece of ‘violent, realistic sword fighting scenes’.2 In Yojimbo‘s narrative Kurosawa continuously alludes to the archetype Jidai-geki characters. Yojimbo‘s protagonist is the classical masterless samurai or Ronin. A. J. Anderson explains that the Ronin having ‘lost the lords to whom they owed hereditary allegiance… wander from place to place, seeking refuge, employment, or revenge’.3 The central conflict of Yojimbo‘s protagonist is also traditionally Jidai-geki in style. 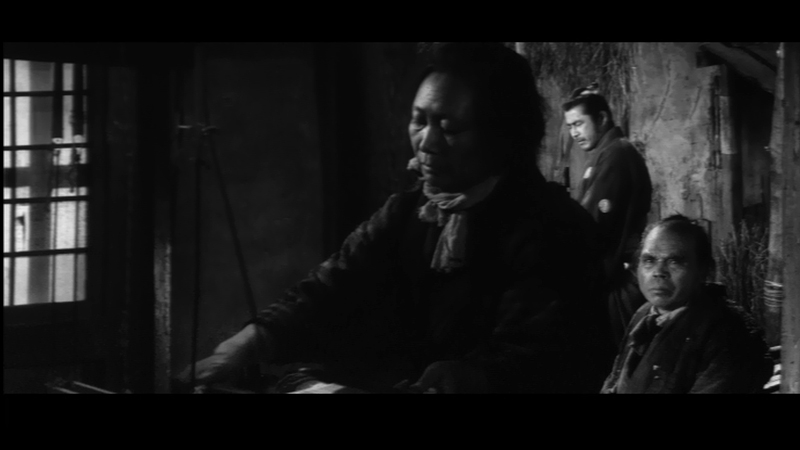 Rather than the central conflict springing from the more traditional external moral conflict between good and bad forces, such as found in many westerns, Yojimbo‘s protagonist’s central conflict is internal rather than external. A conflict between what he wants and what he feels he must do; a conflict between duty or honour and personal gain or desires. When we first meet the central protagonist he wonders aimlessly and throws a stick in the air in order to gain direction. His stay in the town is dictated by satisfying personal desires like hunger and gaining personal wealth. However the longer he stays the more he feels a personal honour and duty in cleaning up the town by forcing the two ‘gambler’ gangs to destroy each other. He stays to help the towns people who aren’t involved in the two gang’s conflict. The narrative moves along first as he attempts to settle an internal battle between his desires and duty, and then to the consequences of his decision. 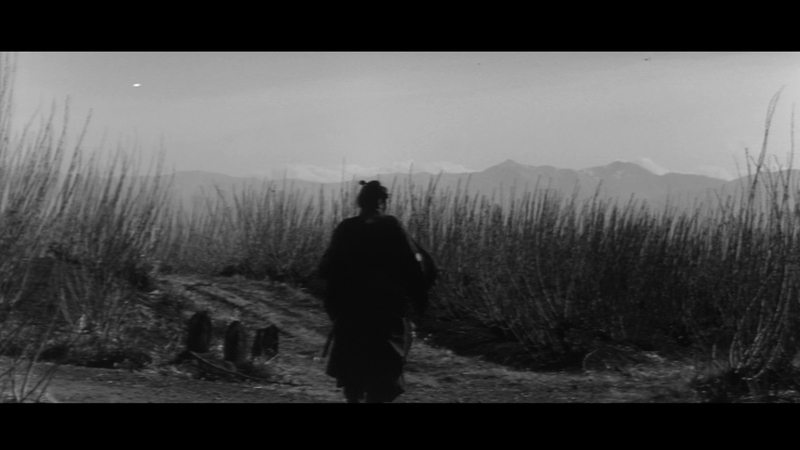 Kurosawa’s Yojimbo follows the Jidai-geki genre narrative structure precisely. Kurosawa uses this traditional Japanese genre because he wishes to analyse contemporary Japan and its changing position concerning personal gain and social duty. This social analysis through genre is exactly like the dialogue America has with its past and present through the western. As Douglas Pye explained, the western is a ‘ confluence of romantic narrative and archetypal imagery modified and localized by recent… experience ‘.4 Essentially the western, and Jidai-geki, is a mixture of a romanticised past, generic characters and imagery which is constantly being re-evaluated with each passing generation of films and film-makers. The construction of character and central conflicts in the western and Jidai-geki are both national in character and hold significant divergences from each other, however they both serve the same function, one of social critique and historical romanticising. 1 J. L. Anderson, ‘Japanese Swordfighters and American Gunfighters’, Cinema Journal, Vol. 12, No. 2 (Spring, 1973), pp. 1-21 p. 1. 2 J. L. Anderson, ‘Japanese Swordfighters and American Gunfighters’, p. 2. 3 J. L. Anderson, ‘Japanese Swordfighters and American Gunfighters’, p. 3. 4 Douglas Pye, ‘The Western (Genre And Movies)’ in Barry Keith Grant (ed), Film Genre Reader II, Austin: University of Texas Press, (1999), pp. 187-202 p. 192. If a traditional western protagonist is a tough pioneer, then Dead Man’s William Blake [Johnny Depp] is the antithesis. A symbol of virginal inexperience Blake jumps in fear at the government sanctioned shooting of buffalo, and is surprised at Thel’s ownership of a pistol. The short lived relationship between Thel and Blake highlights the feminine aspects of the protagonist. While in her bedroom she controls the dialogue, and it is her sexuality that commands the screen space and camera’s focus. Thel’s ownership of a pistol, symbolically phallic, is metaphor of her strength and dominance over the more feminine Blake; it may even be representative of his lack masculinity, a traditional aspect of the central protagonist in westerns is the ownership and ability with firearms. Blake doesn’t sit on the barrier of civilisation and the wild, but the barriers of masculinity and femininity. As well as character, the setting no longer reflects that rugged isolated individual thought of as so admirable, the landscape is seemingly a representation of paranoia and neurosis. 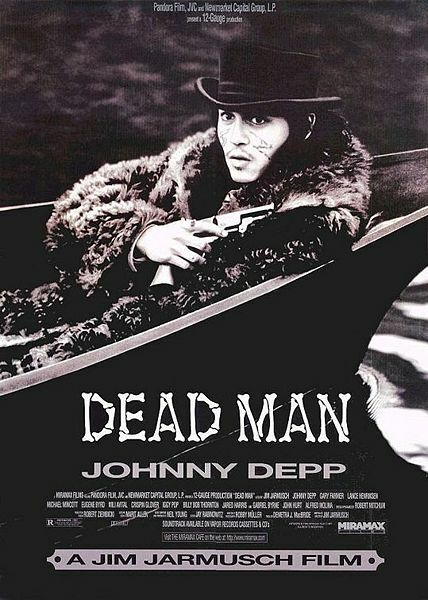 The form of Dead Man creates a close, claustrophobic vision of the American with close-ups, point-of-view shots and landscapes with vertical lines that splinter and fragment the screen. This reversal of generic convention foregrounds the error of the traditional perceptions of the west and conceptualized heritage of America. The west wasn’t a large expanse with a sparse handful of Native Americans littering the horizon but an area with colonists, nature and Native Americans in direct competition with each other for breathing room, Dead Man represents the colonists as the trespasser rather than as the trespassed. Most westerns, as in John Ford’s The Searchers, the Native Americans are represented as trespassers encroaching on in the homesteads of the European settlers. Jim Jarmusch highlights the cultural conception of the west as a rugged place of individualistic through manipulation of generic conventions, by exploring convention film becomes a space in-which a director can explore and expand on ideas of critical and theoretical principle. 1M, Pramaggiore & T, Wallis. (ed), Film A Critical Introduction, London: Laurence King Publishing, (2007), pp. 397.